Plastic film starts in large, wide rolls that can weigh up to 2,000 Lbs. Many end users who utilize this material in their own production can’t handle material in this format, or they don’t need such a large quantity of material. 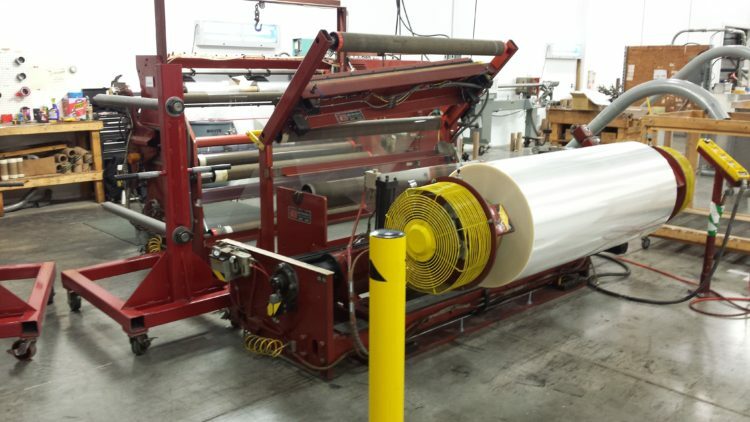 Adhue Graphic Resources has a variety of roll slitting machines that can cut these rolls into narrower rolls, and can also produce rolls that are shorter or longer depending on your project needs. We are happy to provide this service for our own products as well as customer provided materials. Adhue Graphic Resources has a variety of roll slitting machines that can cut these rolls into narrower rolls. 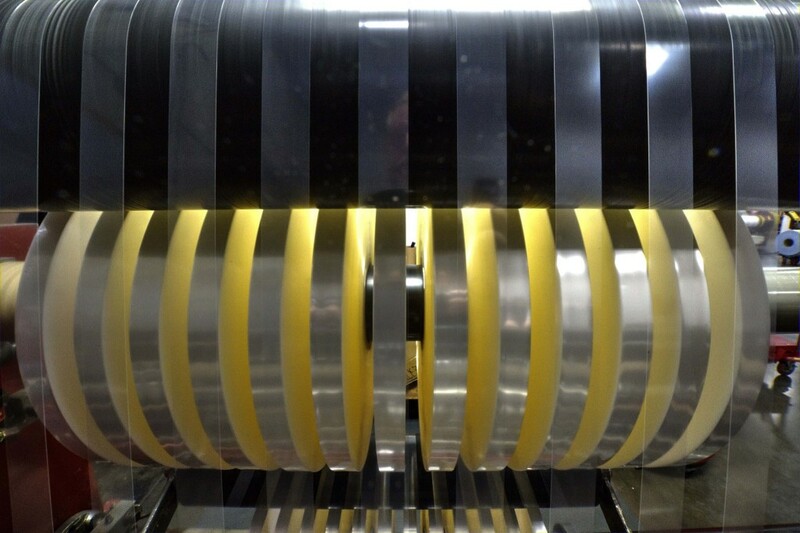 Our rewinding services can also produce rolls that are shorter, longer, or on a different sized core. We provide this service both for our own products as well as your material supplied by our customer all depending on your needs. The most appropriate slitting technique to use depends on a variety of factors, such as the type and thickness of the materials being processed. With well over 40 years of converting experience we've gained valuable insight into which type of slitting is appropriate. Pros: This is the most economical method, along with having a fast and easy setup. Cons: This method is not capable of easily cutting through heavy, rigid, or abrasive materials. At high speeds, the wrong razor blade can burnish film. If enough heat is generated, it will melt the film, creating a bead that is detrimental to achieving good winding. We always match the right blade to the material being converted. This slitting method uses two rotary knives to produce the same cutting effect as obtained by pushing a pair of opened scissors through a sheet of paper. It is used for slitting heavier gauge material such as thicker plastic, paper, foil, and most laminates. Pros: The benefits of this method include accurate slit widths and close tolerances. Cons: The setup for this method needs to be extremely precise, and requires achieving an ideal angle at the junction of the blades. Also referred to as “crush cut,” the score cut method is the oldest form of cutting and the first employed on slitters. It involves crushing the material to sever one part from the other by using a dull knife making contact with a hard surface. This method is ideal for slitting pressure-sensitive adhesives, since it creates a “dry,” non-sticky edge. Pros: Quick setup is a major advantage of this method. Cons: When the score cut method is used to slit paper material, it creates dust that can accumulate and cause equipment malfunction. Also, if a defect appears when slitting plastic film and sheet, this can create film stretching and deformities (leading to rejects). When used on hard plastic, it may cause cracking. While this information will help you determine which methods may be best for your application, it’s important to keep in mind that every project has different goals and uses different machinery, materials, and processes. Contact the sales staff to discuss the specifics of your slitting and rewinding project!